April 1 was the date for the second clue in the mystery to be revealed. I arrived at Quilt Trends bright and early to get the new clue. This week we added a triangle to the same pieces that we made in the first clue. 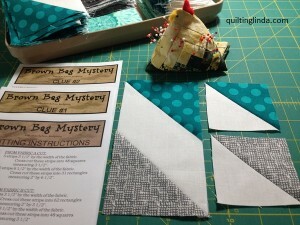 Using the ruler that I purchased for the first clue, I added the new fabric and again had leftover triangles. Not wanting to waste the beautiful fabric, I pieced them into half square triangle squares. I now have a total of 96 squares to be used for another project. Here is one of the mystery quilt pieces and two of the half square triangle units that have been made from the leftovers.